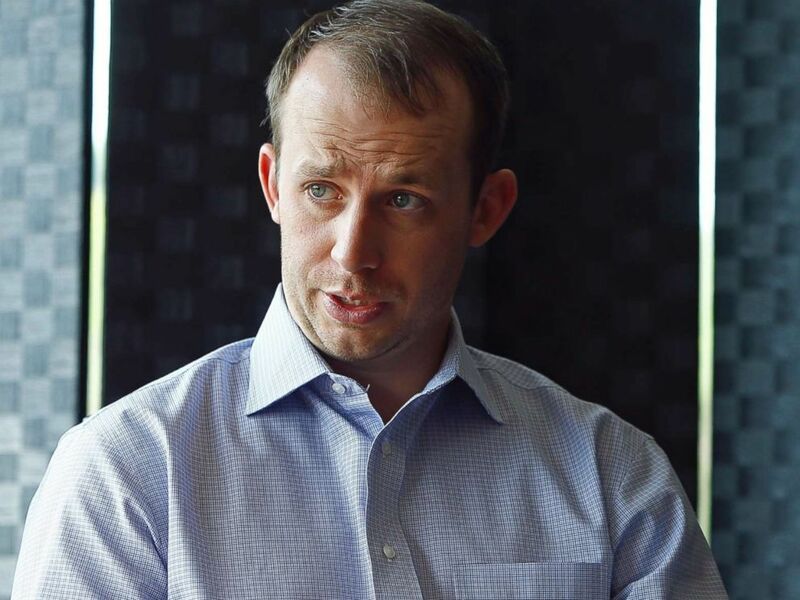 On the heels of teacher uprisings across the country, a high school teacher narrowly upset Kentucky House Majority Leader Jonathan Shell in the Republican primary Tuesday night — an early and loud signal of the potential political force of educators. R. Travis Brenda edged out his opponent by 2 percentage points with only 123 votes separating the two candidates, according to unofficial results from the Kentucky secretary of state. "It had been close throughout the night," Brenda told ABC News during an interview Thursday morning before school started. "It’s been overwhelming since then. It’s been an exciting journey." The high-profile race pitted a rising star in the state Republican party against a math teacher, who joined colleagues for protests against members of his own party in Frankfort on April 2. House majority floor leader Jonathan Shell speaks during an interview, May 3, 2018, in Mt. Vernon, Ky.
Kentucky is seeing an "unprecedented" number of teacher candidates pursuing political office, according to David Allen, a retired Kentucky school teacher and former president of the Kentucky Education Association. Among the 40 educators who filed to run by the Jan. 30 deadline and the five more who announced their intention to run as write-in candidates, Brenda is part of a wave of teacher candidates representing the highest number of educators running for office in Kentucky history. And Brenda notes that the cohort of teachers running for office in Kentucky is representative of both parties. "The educators that are on the ballot, there is a mixture of Democrats and Republicans," he said. "I think there are 8 or 9 or 10 of us that are Republicans out of the 40." 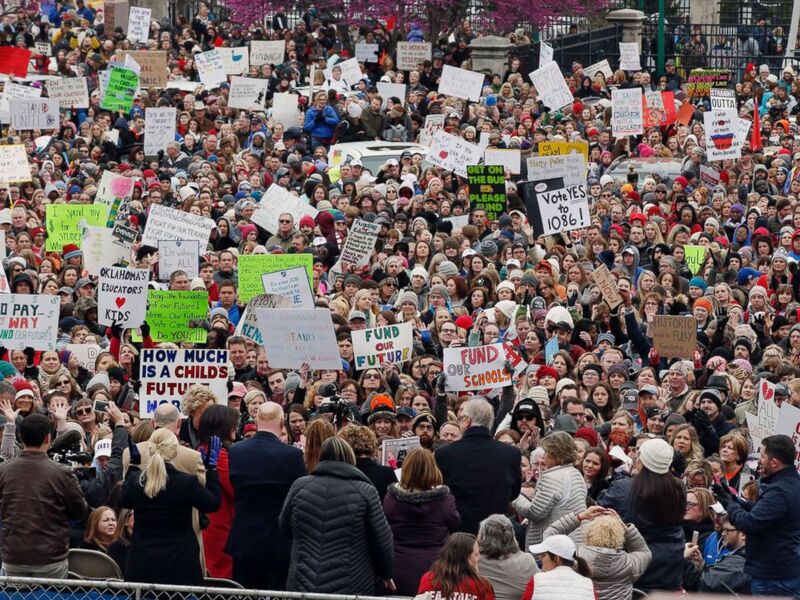 Educators from the Bluegrass state joined the groundswell of teacher walkouts in West Virginia, Arizona, and Oklahoma in response to the legislature’s proposed reforms to the state’s public pension systems that educators said left the public out of the process. The new pension system moves future teachers into a "less secure" hybrid system, according to Jason Bailey, executive director of the Kentucky Center for Economic Policy. It also ends the inviolable contract, which he said will be "shifting more of the risk to the teacher." An actuarial analysis of the law’s impact reveals it "does not save money," Bailey said. He added that he expects the reforms to affect recruitment and retention, pointing to the decrease in recruitment for state employees after a similar kind of plan was installed five years ago for state employees. Shell was one of the architects behind the controversial pension legislation. "As House Majority Leader, I serve on the conference committee ... and am fighting for a fiscally responsible budget that makes critical investments in education, pensions, and law enforcement — while also making the necessary cuts to government to ensure fiscal responsibility," he said of the bill in a statement before it officially became law. The bill passed both the state House and Senate in a matter of hours before being signed into law by Governor Matt Bevin last month. 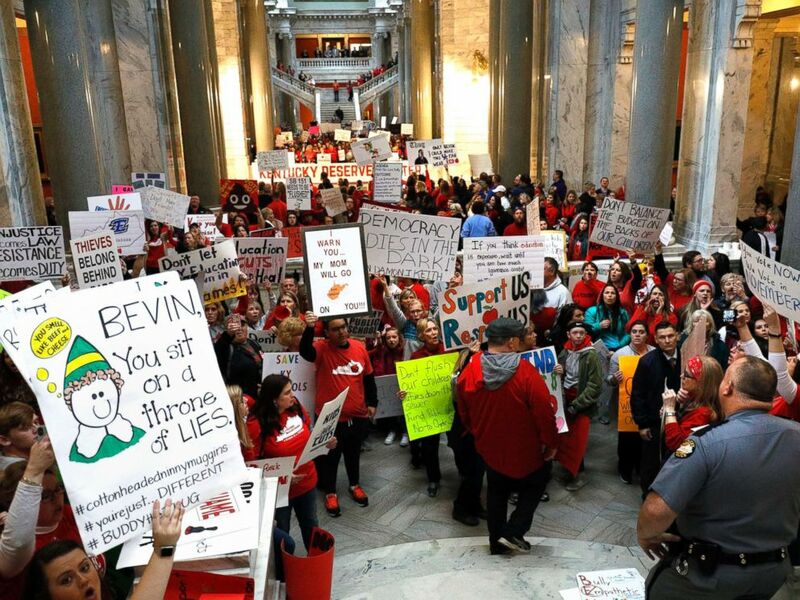 Public school teachers and their supporters protest against a pension reform bill outside the senate chambers at the Kentucky State Capital, April 2, 2018 in Frankfort, Ky. Shell lost his re-election bid despite support from national Republican figures, including U.S. Senate Majority Leader Mitch McConnell. "He’s one of the most important Republicans in Kentucky already," McConnell said to the Lexington Herald-Leader of Shell. "And he’s not 30 years old." Shell did not respond to ABC News’ request for comment. Republican voters in the 71st House District opted for the 19-year teacher currently at Rockcastle County High School. Brenda, despite being a member of the same party that passed the pension reforms, said he opposes the new law. He also clarified that during the protests, teachers were not asking for more benefits or pay. He said they aim to simply "keep what they were promised." Brenda believes that the teacher movement stemmed from brewing frustrations with state leadership and Gov. Bevin who he asserts, "pushed an agenda that may not necessarily line up with what the folks back home want them to do." "I’m glad there’s been this sense of awakening," he added. "Education should not be a partisan issue. It should be non-partisan. It should be people reaching across the aisle to say what do we need to do that is best for our students." Brenda will face Democrat Mary Renfro in the November general election. Kentucky isn’t the only state seeing the impact of teacher activism and engagement this election cycle. In West Virginia, the first state to see massive protests earlier this year, state senator Richard Ojeda made fighting for public education a core component of his platform in a deep red state. "When it comes to teacher compensation, our state is ranked one of the worst in the nation. Schoolteachers are the heart of our community and they deserve better," Ojeda wrote in one of multiple Facebook posts about a petition to support teachers. He won the Democratic nomination in the 3rd Congressional District, even surging in Trump country, after gaining strong support from teachers in the state. Ojeda has a shot of winning in November if his cross-over appeal continues to hold and carry him through the general election. Oklahoma, another state that faced an uproar from teachers, already saw the influence of candidates coming from the classroom. In 2017, Jacob Rosecrants ran as a "teacher for House District 46" and successfully flipped the seat from red to blue. The crowd cheers during a teacher rally at the state Capitol in Oklahoma City, April 2, 2018. President Donald Trump won the open congressional seat by 10 points in the 2016 election but Rosecrants’ victory was the third seat to flip in Oklahoma since Trump took office, according to the Democratic Legislative Campaign Committee. "Progress, public education, and long-term budget solutions resonated with Oklahoma voters, turning this once reliably-red seat blue," said Democratic Legislative Campaign Committee Executive Director Jessica Post after Rosecrants won. The state will hold primary elections for this cycle in June. Teachers aren't alone in non-traditional candidates making forays into politics this season. More than 200 scientists, technologists, engineers, and mathematicians also entered the political fray this year as novices. Kentucky is seen as an early test for these activists, and with more high profile races still to come, teachers are already proving their political might in 2018.